Have you ever misplaced a key card that is needed to enter work? Or maybe can’t find your rail pass? Or as an employer, can you truly track access and secure a facility in this age of technology? But, what are you willing to trade for that security and access? Some companies and people are now taking the step of embedding access into bodies through technology. They insert a microchip under the skin; with an embedded chip, there is no risk of losing access passes, or of being robbed of an important access pass. It might sound a little like fiction (think, ‘James Bond’), but it is now a reality for thousands of people in Sweden. The microchips are designed by the Swedish company Biohax to make life easier and more secure. Those in favor of the microchips say they are safe, but others raise concerns about privacy, health, and hacking. The chips are the size of a grain of rice and cost an estimated $180 per chip. Using a syringe, the chips are placed into the skin between the thumb and forefinger and have the capability of transmitters. For example, the chip can enable users to open doors, start cars, contain critical medical data, transfer personal data, and more. In Sweden, the largest train company has started allowing commuters to replace tickets with the chips. There is also talk that the chips could be used to make payments in stores and restaurants. What do you think? Want a chip under your skin? What are the characteristics of the target market for this product? For Biohax microchips, have students work on the actions taken in each of the five steps. Have you ever been at an event and noticed that the use of smart phones distracts from the moment? (Or at least other people’s phones distract from the moment!) This can be a significant problem for venues and artists who want to create a phone-free environment. It’s a good idea, but getting people to give up their phones is tough. 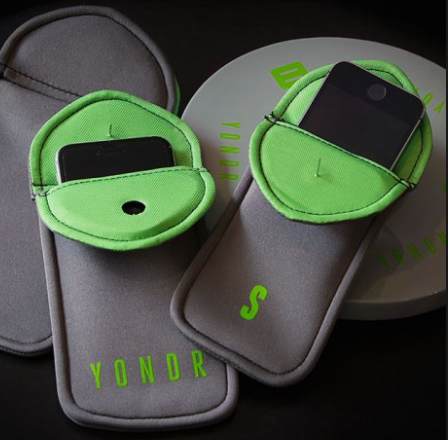 There is a new solution though from a company named Yondr – the Yondr phone pouch. It’s a simple concept. As people arrive at an event, they place their phones in Yondr cases. Inside of the phone-free zone, the cases automatically lock. People keep possession of their phones and the phones are not disruptive during performances. To unlock the case, simply step outside of the phone-free zone. Many artists have embraced the cases. Comedian Dave Chappelle has made it mandatory for all his shows, and other artists such as Alicia Keys, the Lumineers, and Louis C.K. are also using the phone cases, as are some schools. But breaking people’s addiction to smart phones is still a tough sell. Put away your phone and enjoy the moment! Discuss the use of phones at events. Ask students what their experiences have been and how they feel about phone-free events. It’s a problem faced by college students (and all bike riders) everywhere – a stolen bike! We spend hundreds, sometimes thousands, of dollars on bicycles that are depended on to get us to places on time. But, the very thing that makes bikes beautiful and useful – their portability and accessibility – also makes them a prime target for thieves. Luckily, Dutch manufacturer VanMoof has developed a smart solution using technology to help keep our bikes exactly where we left them. The new product, named SmartBike, is designed to thwart thieves, and even if it is stolen, the bike can be tracked and found. In fact, VanMoof is so confident that the bike can be found that if it is stolen, the company will spend up to two weeks tracking it, and if it can’t be found, the company will replace the bike. Nice. There are a lot of additional features on the bike. It’s connected to your smart phone so that you are the only person who can unlock it. Anti-theft parts include a keyless lock built into the frame and tracked using GSM and Bluetooth technology. It has integrated automatic lights, an enclosed drive-chain, and can even be purchased with an electric-assisted motor to make commutes easier. Go ahead thieves, just try to steal this bike! Poll students: How many have bikes? Depend on bikes for transportation? Have had a bike stolen? Discuss the importance of clearly defining a target market. For this product, what is the target market? Divide students into teams and have each team develop a profile of a target market. Include demographics, psychographics, behaviors, values, attitudes, etc. Based on the target market profile, what makes this product unique for these customers?